The OPTN has approved a continuous distribution model as a framework for future policy development as it addresses geographic distribution of donated organs. Continuous distribution would, in the future, replace fixed geographic boundaries with a statistical model incorporating distance along with key clinical factors. Organs can be distributed to candidates using a statistical formula that combines important clinical factors, such as medical urgency and likelihood of graft survival, along with proximity to the donor location. Using this approach, all candidates would receive a relative distribution score, but there would be no absolute geographic boundary. Candidates who best meet the combination of factors receive the highest priority. In this example, there are no fixed boundaries between transplant hospitals. 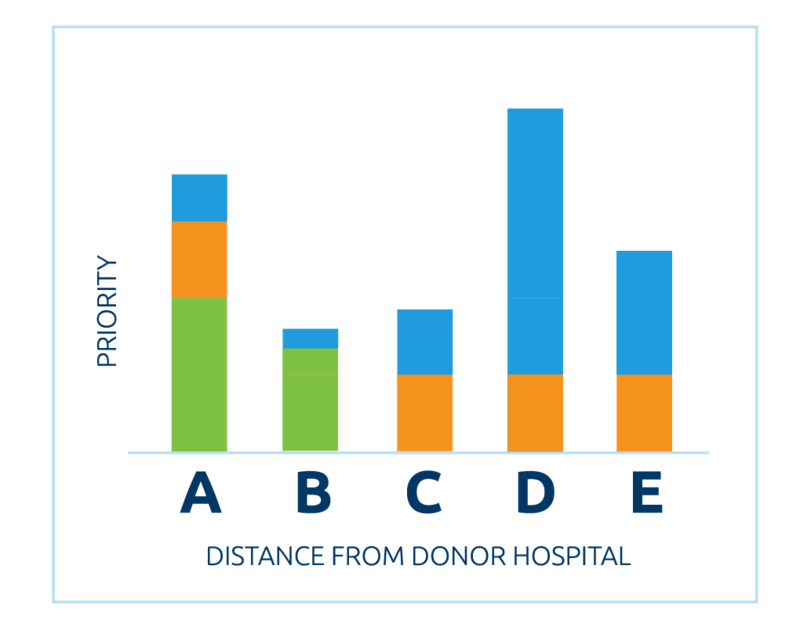 The donor hospital is closest to Hospitals A and B, so candidates at those two hospitals receive some points for proximity. Hospitals A, C, D and E all have candidates who are a close biologic match. Hospitals D and E both have candidates with elevated medical urgency, with Hospital D having the most urgent candidate. When these various factors are combined, a candidate at Hospital D would appear first on the match. This candidate receives no proximity points but ranks strongly based on medical urgency and biologic compatibility. The candidate appearing next on the match is at Hospital A, with a combination of priority for proximity and biological compatibility. Candidates at the other three hospitals appear lower on the match according to how strongly they match on the combined factors. Read an update from the chairs of the kidney and pancreas committees. Download the Proposed Distribution Frameworks (PDF). View the Ad Hoc Geography Committee‘s charge, its members, and summaries of previous meetings. View a presentation delivered to the committee addressing legal and regulatory history and perspectives for organ distribution in the United States. Read an article in the Journal of Health & Biomedical Law analyzing legal issues related to the emergent lung allocation policy enacted in November 2017. Read a June 6 memo to members from OPTN/UNOS Board President Yolanda Becker, M.D. Read a June 20 memo to members from OPTN/UNOS Board President Yolanda Becker, M.D. Read a July 31 memo from HRSA Administrator George Sigounas, M.S., Ph.D., to UNOS regarding further development of organ distribution policies. Read an August 13 reply from UNOS to HRSA’s memo of July 31. Read more about alternative distribution approaches for kidney-pancreas. Watch Kevin O’Connor, chair of the Ad Hoc Geography Committee, discuss the frameworks that will be proposed for public comment.